Aham brahmasmi. This is an aphorism from the Vedic literature, expressing the essential identity of each living being. Aham means “I am.” What am I? Aham brahmasmi: I am Brahman, or spirit. In materialistic life, one identifies himself with bodily designations thinking, “I am American” or “I am English,” “I am black” or “I am white.” One has to become free from such bodily designations and understand oneself to be Brahman, a purely spiritual soul. This is partially correct. The word Brahman applies first to the Supreme Absolute. 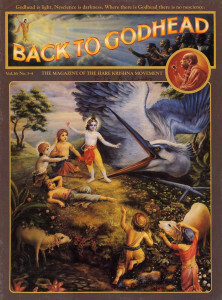 And because all living entities are part and parcel of the Supreme Absolute, they too are called Brahman, just as drops of water from the ocean may also be called “ocean.” And just as drops of water have the same chemical composition as the ocean, all living beings have the same spiritual qualities as the Supreme. All living beings, therefore, share in the qualities of sat (eternity), cit (knowledge), and ananda (bliss). Yet quantitatively the living beings are different from the Supreme, for the Supreme is the whole and all other living entities are tiny parts of the Supreme. The Supreme is infinite; the living entities, infinitesimal. According to Bhagavad-gita, when a living entity realizes his identity as Brahman, he becomes joyful, free from hankering and lamentation, and equal toward all other living beings. He then engages himself in the devotional service of the Supreme Brahman the Personality of Godhead, Krsna. Ahankara. False ego. In pure understanding of one’s self, one thinks, aham brahmasmi: “I am spirit.” In contrast, one who lacks this pure understanding misidentifies himself with matter. So he thinks, “I am this body.” In other words, he identifies himself with temporary bodily designations—white, black, tall, short, young, old, and soon. When scientists propose that life and consciousness are but temporary phenomena arising from organic chemicals, they too advocate such a misunderstanding of the self. Bhagavad-gita describes the inferior energy in gross and subtle divisions, beginning from the most tangible and gross, such as earth, water, and fire, and proceeding to the most subtle, such as mind and intelligence. And the most subtle of all the material elements—the very point of contact between the inferior, material energy and the superior, spiritual energy—is ahankara, the false ego, the spiritual soul’s false identification with matter. The mind and intelligence of a living being are subtle aspects of matter, whereas his physical body is gross matter. Therefore, when a living being identifies himself with either his gross physical body or his subtle mind and intelligence, he is under the influence of false ego. Because of false ego, people engage in false, superficial activities, which give rise to a false mode of civilization. Such a so-called civilization, built upon the bodily concept of the self, smothers the spiritual life of its people. By the influence of false ego, one takes credit for doing everything independently. Material nature controls all the world’s living beings, but illusioned living beings, failing to understand that their material bodies are machines working under nature’s laws, fancy themselves winning control over nature. Thus they become ever more entangled in nature’s complexities. One can free oneself from this entanglement only by giving up one’s false ego and returning to one’s real ego. Ego, or identity, need not be false—one also has a real ego, a real identity: every living entity is an eternal servant of God, or Krsna. If one relinquishes his false identity but tries to extinguish this real identity also, he is attempting spiritual suicide. One must give up the false identity and come to his real, eternal identity. He then becomes a liberated soul. As confirmed in Bhagavad-gita, every living entity is eternally a tiny part of God. Therefore, if by mental speculation or misguided mysticism one concludes that he himself is God, he falls prey to the ultimate snare of false ego. Only one who realizes himself to be an eternal servant of God becomes perfectly situated in self-realization. Ahimsa. Nonviolence. Nonviolence is one of the preliminary qualifications for advancement in religious or spiritual life. Every religion, therefore, proscribes needless violence. But violence is unavoidable, for the material world is by nature a violent place. Sometimes violence is necessary for the protection of innocent lives, and shrinking from such necessary violence leads to still greater violence. Violence, therefore, must be undertaken in obedience to religious principles and employed only for the welfare of others. Violent acts impelled by ignorance and greed are always condemned. We should not regard violence and nonviolence only in relation to the body. The body is temporary and its destruction inevitable. More important than the body, therefore, is the eternally existing consciousness, or soul, within the body. The soul is meant for spiritual advancement, and anyone who needlessly impedes the spiritual advancement of the soul is guilty of violence in the extreme. Nor can one justify being nonviolent toward human beings but violent toward animals. Animals are also creatures of God, and they also have a right to live undisturbed. When fruits, grains, vegetables, and milk are abundant, a slaughterhouse is a symbol of barbarianism. The mouth that speaks of peace and nonviolence but feeds on the blood and flesh of slaughtered animals is the mouth of a hypocrite or a fool. Although the proprietor of the LBJ Ranch wanted to build a Great Society, he had to suffer the ignominious slaughter of his country’s young men in a bitter and profitless war. By the laws of karma, acts of ignorant violence bring violence in return.